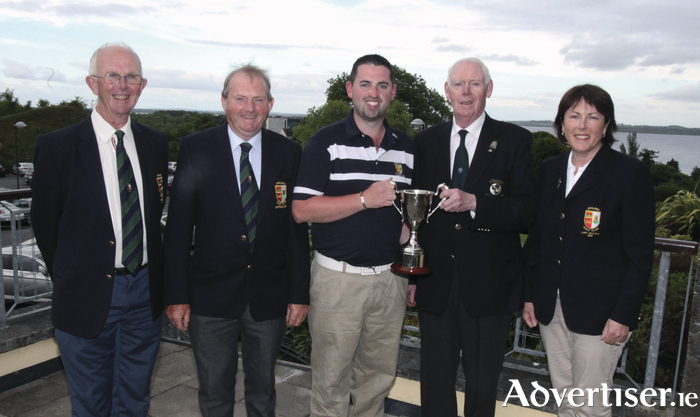 Athlone man Thomas O'Connor won the inaugural Connacht Strokeplay Championship, hosted in Athlone Golf Club. Pictured (l-r) are Michael Cleary, president Athlone Golf Club; John Burns, captain Athlone Golf Club; Thomas O'Connor; Jim McGovern, chairman, Connacht Branch GUI; and Margaret Geoghegan, lady captain, Athlone Golf Club. A huge thank you to everyone who came along and supported Shop from My Closet last Friday evening. A special word of thanks to Marion O'Shea and Pam Hogan for their invaluable help and expertise. Photos can be viewed on Athlone GAA Official Facebook page. The next event is Lip Sync which takes places on Saturday, September 3; see www.athlone.gaa.ie for more details. The annual Frank Starken Memorial Golf Classic 2016 takes place in Athlone Golf Club this Friday June 17. Please contact Denis O'Sullivan at (086 ) 8542800 to book a tee time or to sponsor a team. Everyone welcome. Athlone playwright Jean Farrell's play The Six Marys will be performing this Friday night, June 17 in Birr Theatre and Arts Centre at 8pm, back again, by popular demand. For tickets call (057 ) 9122911. Athlone Table Tennis Club will continue to operate throughout the summer on Mondays and Wednesdays at 7.30pm in St Mary's Hall, Northgate Street. There are eight tables available for use and bats are provided. All are welcome. Founder of Kinergetics, Philip Rafferty, is coming to Ballinasloe and will be demonstrating pain corrections on volunteers with arthritis, fibromyalgia, chronic pain, and trauma in the Shearwater Hotel on Saturday, July 16. Some free sessions are still available. Pre-booking is necessary for all dates; call (090 ) 9646585. He will also be holding clinics in Jorena’s Health and Gift Shop in Society Street, Ballinasloe on Saturday July 23, Saturday August 6, and Friday August 26. In recent weeks amazing work has been done around the old shop, school, and churchyard by cleaning and painting, weather-proofing and tidying. If you are handy with either spade or brush we need your help on Tuesday evenings for an hour. Every helping hand lightens the load. Castledaly GAA annual 5K Fun Run and 10K Road Race will take place on Sunday, June 19 at noon, with registration from 10am at the GAA clubhouse. Fees as per last year, adults €10, U16s €5, families €20. There will be refreshments afterwards and activities for kids on the playing fields during the race. Thanks to everyone for their continued support. Fit Club continues on Tuesdays and Fridays at the GAA grounds, with Junior Fit Club at 6.30pm followed by Seniors under the guidance of Paulette Heavin. A special open-air Mass and pattern prayers will take place at the Clonmacnois Ruins on Friday, June 17 at 9pm. This will be followed by a night vigil in the Cluain Chiarain Centre with Eucharistic Adoration which finishes at 2.10am. All are welcome. For enquiries please contact Dave on (085 ) 7746763. A family fun day in Dún na Sí Amenity and Heritage Park takes place on Fathers Day, this Sunday, June 19. The day will include an open-air concert with special guests including Ray Lynam, Simon Casey, Joe Rabbitte, Celtic Blondes, Project 21, White Diamond, Legacy, and We Love Short Shorts, plus a special appearance by Elvis (Greg Traynor ). The day also features a funfair, children's races, vintage display, and lots more. The organising committee are looking for items for the bric-a-brac, handbag sale, cake sale, and items for the wheel of fortune. If you can help in any way, please contact Olive Quinn on (087 ) 9306308. Garrycastle Ladies U14 team are all set to head for the All Ireland Féile in Limerick on the weekend of June 24. The team members and parents held a fundraising cake sale and car wash last Saturday, followed by a medal presentation to the team that represented the club at the Westmeath Feile U14 competition in Athlone. The presentation was attended by team members, their parents, sponsors, Mayor of Athlone John Dolan, James Dolan (Westmeath Senior Men's team ), and Danielle Madden (Westmeath Minor Girls team ). The club are very appreciative of the support given to them by the local community and businesses. Thanks to Dan's Tavern for their support and to everyone who helped on the day. Independent People with Disabilities will hold their Annual General Meeting in the Prince of Wales Hotel, Athlone on Thursday, July 14 at 7.30pm. Minister for Communications, Energy & Natural Resources Denis Naughten will open the meeting. Guest speaker on the night will be Olivia Lennon from Athlone who has an acquired disability and is currently searching for employment. Congratulations to Moate Community School ladies football team who recently won the Lidl post-primary schools instore competition in Athlone. The school won a set of jerseys, bibs, cones, water bottles, and balls. The girls will be well set for the football season in September. It has been a superb year for the MCS ladies, winning the senior Leinster B title and reaching the final of the U16 and semi-finals of U14 championships. The Tidy Towns Committee is seeking support in preparing the town for the Pride of Place adjudication on July 14. For the next few weeks they will meet at St Patrick's Church every Tuesday and Thursday evening from 7.30-9pm. A programme of work has been organised and the committee would be grateful for any help in its implementation. Support St Hilda’s Services while exercising (gentle warm-up followed by a walk/jog ) in the park every Tuesday and Thursday from 7.30-8.30pm. Participants are invited to contribute €2 a night which will go towards St Hilda’s project in the sensory garden in the park. To celebrate Tormey's 50th anniversary, Mass will be held on the Green at 12.30pm this Saturday, June 18, followed by refreshments and entertainment in St Kieran's Community Centre. Music will be by Shanie McLoughlin. All are welcome. Guest musicians are also welcome. Also this Saturday, a 5k and 10k fun run will take place in aid of O.W.L.S. Registration is at 9am. The cost is €15 per person and €20 per family. Race commences at 10am. Phil Vassar is in concert with The Sheerin Family Band on Tuesday, June 28 at 8pm. Tickets are €18. Uisneach, an exhibition by artist Sheila Martin, is on display in the Bob Traynor Gallery for the summer months. For all bookings and enquiries phone (090 ) 6482042 or email [email protected]. Congratulations to the three lads from the club - Tom Kellegher, Matthew Whittaker, and Neil Kenny - who are currently involved with the Westmeath U13 Development Panel. The panel had three teams out and played three 30-minute games against Wicklow on Saturday and won all games. Well done to the Tubberclair players and all involved.